OUT - Take Your Kendama From Slick to Stick! 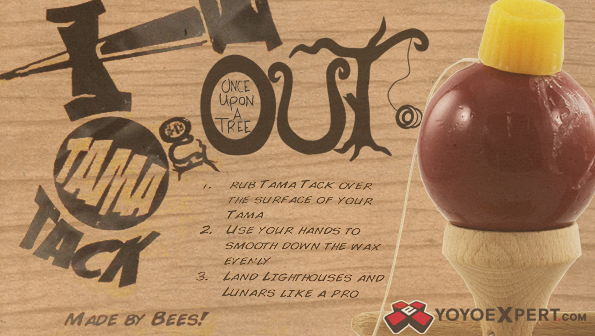 The new Once Upon a Tree Tama Tack is a cool new bees wax based kendama enhancement! It was designed to give your kendama just the right amount of stickiness to help you land those tricky balance maneuvers. Just follow these 3 easy steps and you will be on your way to kendama bliss! Step 1: Rub Tama Tack over your tama (The tama is the ball). Step 2: Use your hands to smooth down the wax evenly (Use your bare hands! rubbing it in with cloth or paper will not have the same effect).